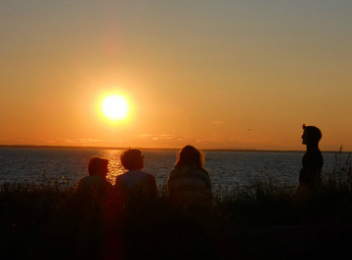 ​At YES, we spend the week attending and leading workshops, playing music on the porch, dressing up for themed community dinners, watching incredible sunrises and sunsets, joining together in nightly worships, and much more! Every individual is celebrated for their choice to be involved however they are comfortable. All shoalers are encouraged and empowered to lead activities, and to share their knowledge and experiences if they are interested. For many youth, YES represents a first opportunity to begin defining a sense of identity, and the conference provides a supportive, welcoming, challenging, and encouraging group for this exploratory stage of life. The conference spans a wide age range, from mid-teens (16) to early young-adulthood (22). Younger conferees find role-models and mentors, and then gradually become those role-models as they return to YES year after year. 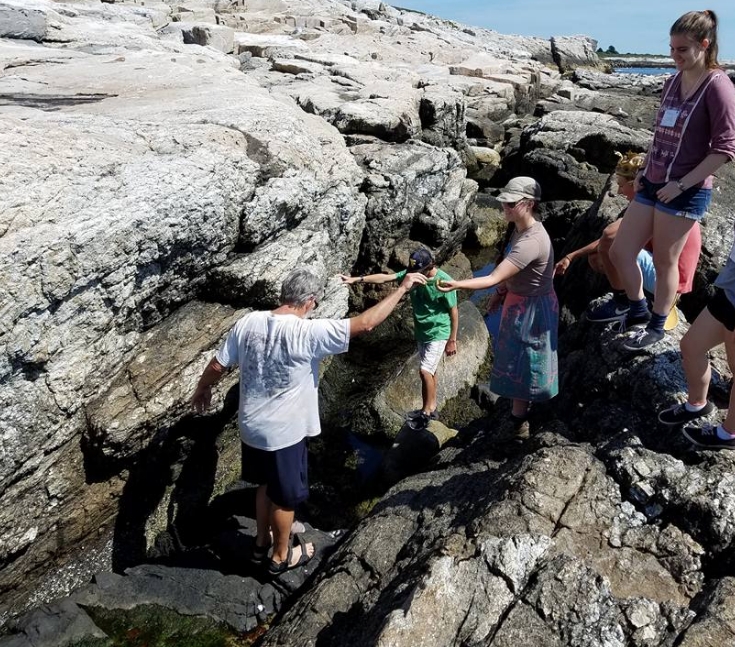 In its over 30 years on Star Island, our youth-led conference has been known as Liberal Religious Youth (LRY), Young Religious Unitarian Universalists (YRUU) and more. As we enter this new era as Youth Empowerment and Spirituality (YES), we have held onto the core values that have served our conference for decades, while adapting to the ever-changing needs within our community as we move forward. Members of our conference, known as "shoalers", spend the week attending a variety of discussion and activity-based workshops. 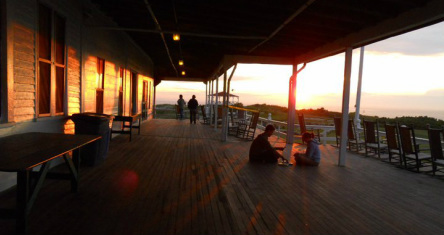 Conferees may also spend time dressing up for theme dinners, playing guitar on the porch, watching incredible sunrises and sunsets over the open ocean, participating in nightly worships, and so much more! Our 2014 Softball Team photo: Ready for battle against the Pels! During the day, shoalers participate in workshops of their choice which are designed and run by other conferees. Although they vary each year, some of our common workshops include Social Justice Discussions, Softball, and Arts & Photography. Shoalers old and new who are not designated workshop leaders also have the option to create and run their own workshops, called "one-shots", throughout the week. Some of our famous one-shots have included Middle School Gym Class, Ghost Tour, and Shoe Golf! Recreational workshops provide a fun way for shoalers to get to know each other better and unwind from the stresses of mainland life. Workshops such as social action encourage thoughtful discussions and push conferees to be active members in both their local and global communities. During the week, each of our dinners are given a creative and unique theme which shoalers are encouraged to dress up for. Themed dinners are often followed by all-cons such as Improv Night, our "Coffee House" talent show, and the ever-exciting annual Auction! Many shoalers also choose to simply relax and enjoy the sunset. Worship encourages shoalers to seek their own individual sense of spirituality and connections with the world. Through the guidance of a conferee selected to be that year's Worship Coordinator, shoalers are led through meditations that empower them to explore their own sense of self and strengthen the sense of community within the conference. Although the Worship Coordinator oversees the process of planning each night's worship, all shoalers have the opportunity to participate in a workshop to help plan them, and attendance is completely optional. In their free time, shoalers enjoy playing frisbee on the front lawn, sunbathing, swimming in the chilly Atlantic ocean, exploring the island, playing card games by the snack bar, playing music together, and so much more. To the left are some photos from our Edible Seaweed tour during Summer 2016, with Star Island's Marine Lab Manager and Botany expert! All of these elements and more make the YES conference a rare opportunity to explore a deeper connection with both the people and world around us, and examine life on the "mainland" from the safety of a beautiful island miles away. Youth empowerment is a delicate balance between enabling youth and young adults to demonstrate their ability and leadership skills while having ready support, guidance, and feedback from adults who have extensive experience working with youth conferences. We’re proud of how our conference creates a safe environment for young people to find their voice. Our conference is run by a staff of 8-10 young adults, ages 16-22, who handle conference planning, worship services, group facilitation, registration, and logistics, both on and off island. On island, we have four adult advisers and a minister, Rev. Dave, who are an integral part of our conference. The conference chairs stay in frequent contact with the adult advisors before the conference, and during the conference rely on them for guidance on various matters. Our advisors and Rev. Dave work together to ensure the physical and emotional safety of all of our participants. In our many years on Star Island, we have had few predicaments which require emergency attention, but when they do arise, adult advisors and Rev. Dave work with the conference chairs to take care of them. For some of our conferees, this is the first time they've been away from home, which can be challenging. Each year we train ten young adults to act as chaplains and provide emotional support to conferees to ensure our conferees have access to peer and adult support throughout the week. The YES conference is hosted on Star Island, a beautiful location off the coast of New Hampshire. As part of the Isles of Shoals, Star Island is revered for its historical background and the experiences it has provided for religious, educational and family retreats over the years. Since 1915, the island and its sponsorships have been organized by the nonprofit Star Island Corporation. To learn more about the island, feel free to check out their website. You can also take a tour of Star by watching the video below.